PLEASE NOTE: The FAS Tutor CD-ROM is no longer distributed. It was first released in 1998 and is no longer fully compatible with today's computer operating systems. All information presented in FAS Tutor are currently available in the most current FASD 4-Digit Code Diagnostic Guide. The instructional animations, videos and photographs are posted on this website. 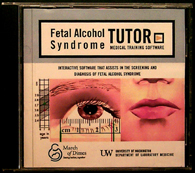 A compact disk entitled Fetal Alcohol Syndrome Tutor™ had been created by the University of Washington FAS DPN to instruct medical professionals, through video, computer animation and photographic examples, on how to screen and diagnose FAS. The CD-ROM ran on both PC and MacIntosh computers. The CD-ROM introduced professionals to the FASD 4-Digit Diagnostic Code (Astley & Clarren, 1997, 1999, 2000). 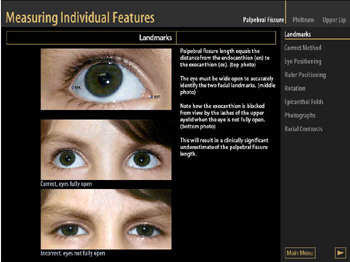 It also instructed medical professionals on how to screen for FAS using the FAS Facial Photographic Analysis Software developed by Susan Astley, Ph.D.
Below are a few examples of images/animations from the CD. How to measure the palpebral fissure length. Video demonstrating the use of the Lip-Philtrum Guide. If you do not see the animations playing in the windows below, that means you do not have Quicktime installed on your computer. You can download it for free from Apple. Accurate measures of the frontal photo require standardized alignment of the patient's head relative to the clinician's eyes or the camera lens. You should be able to see the patient's ears equally on both sides. Improper rotation will result in erroneous right and left palpebral fissure length measures. When viewing the patient from the front, the clinician's eyes, or the center of the camera lens, should be in line with the patient's frankfort horizontal (FH) plane (green line). The FH plane extends from the tragion (a landmark on the ear) through the orbitale (a landmark under the eye). These landmarks are marked with blue dots. Proper alignment can be judged when viewing the patient from the front by imagining a line drawn between the left and right tragions. Rotate the head up or down until the orbitale landmarks fall directly on the green line (bottom image). Improper rotation will result in erroneous measures of upper lip thiness. For example, if the camera is placed above the patient's FH plane, the patient's lip will appear thinner in the photo, than it truly is. The camera is properly aligned when the line turns green. 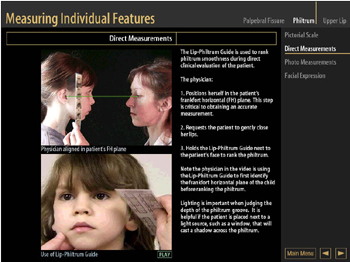 Animation demonstrating proper alignment of the camera to the patient's face. The eye must be fully open to obtain an accurate measure of palpebral fissure length. When the eye is opened fully, by having the patient look up at the ceiling without tilting their head back, the palpebral fissure length is correctly recorded as 2.7 cm (green arrow). A length of 2.7 cm is just slightly less than the mean palpebral fissure length for a "normal" 7-year-old child (green dot). Failure to have the eye fully opened resulted in a clinically significant error of approximately 1 standard deviation in magnitude. Animation demonstrating the importance of the eye being fully open to obtain an accurate measure of the palpebral fissure length.